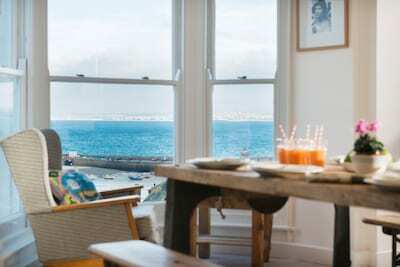 Add a little luxury chic to your coastal holiday and turn the key to your luxury escape at Trelas, St Ives. 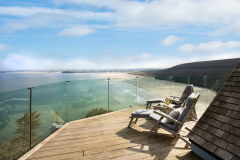 This inspiring home from home has been recently built creating a unique and inviting coastal retreat. Trelas showcases a pure, scaled back Scandinavian style oozing stylish simplicity, a welcome holiday layout and understated elegance. Set over 3 floors, this first class home offers a collection of 4 boutique bedrooms, a light and sunny living room, spacious open plan kitchen/dining area and tempting sun terrace complete with traditional wood fired oven. 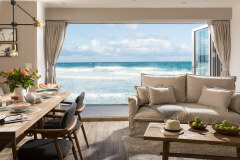 With the cosmopolitan Cornish harbour town of St Ives just a hop, skip and jump from your holiday door, our guests will enjoy the luxury of the location as you explore the golden sandy beaches, buzzing harbour life and heritage of this very special place. Hidden away from passers by, Trelas truly is a secret gem just waiting to be enjoyed. Arrive at street level and descend into holiday luxury as the charm, warmth and character unfold room by room. Trelas is set over 3 floors, the ground floor is the hub of the house with a smart modern fully fitted kitchen and open plan dining space. Holiday menus are easily created as Cornish produce inspires the budding chef, St Ives offers a wealth of artisan producers and fresh ingredients. For added culinary creations, fire up the wood fired oven within the al fresco terrace and dine on homemade pizzas as the sun sets. The old timber dining table is as perfect for afternoon tea-for-two as for celebratory suppers to remember. Climb the handcrafted staircase to the first floor and soak up the natural light and lofty height of the living room. The oversized comfortable sofa is large enough for a full house of 8 to gather as a group and catch up on the day's adventures, pop on a favourite film from the extensive library or perhaps enjoy a quiet afternoon to yourself as the family head out to the surf? 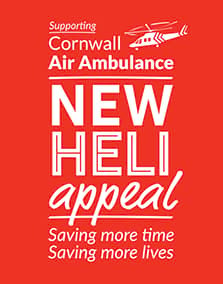 From this elevated level, the views beyond capture the azure blue sea of St Ives Bay and Cornish coastline heading up towards Godrevy Lighthouse. Three boutique bedrooms are located along the attractive hallway that leads up the length of Trelas, subtle slithers of natural light flood the space and help to showcase the bespoke joinery and beautiful craftmanship. 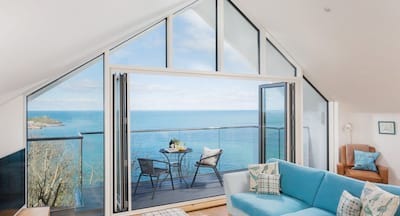 Climb the final stairs to the penthouse level of the master bedroom with far reaching sea views over the characterful rooftops and away up the coastline. The bathrooms are no less considered, each with a contemporary twist for your post coast pamper. From the ground floor, slide back the tri-fold doors and invite the outside in for the ultimate al fresco ambiance. Step out on the large decking area complete with wooden dining table and chairs, sun loungers and your very own traditional wood fired oven! Summer dining is set to impress as you enjoy the unique wood fired taste and crackling fire. 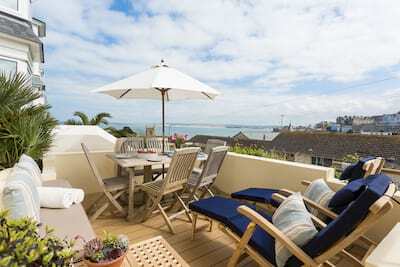 This generous outside terrace is completely enclosed with a small gate leading to steps leading down to a further large gravelled area just perfect for all of your holiday kit from buckets and spades to surfboards and wet suits. 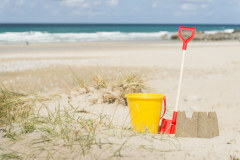 The outside shower is perfectly placed to wash off the sand and salt. 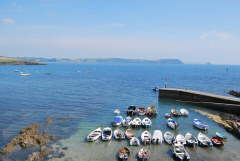 From your holiday door, enjoy the luxury of the location as you wander down to the harbour in moments. 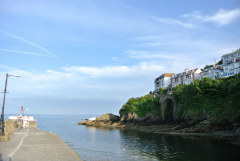 If you are new to St Ives or it is a favourite holiday haunt, this wonderful coastal town has so much to offer. 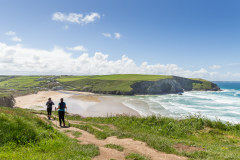 From trips around the bay, surf lessons and kayaking, souvenir shopping and gallery browsing to dining out and taking in the views along the coastal path, leave feeling energised after a healthy dose of vitamin sea and Cornish zen. 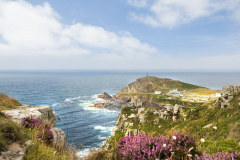 Day trips are easily planned as the gateway to West Cornwall leads you down the coast towards Sennen and Land's End and the wild beauty of the high cliffs and sandy shores. 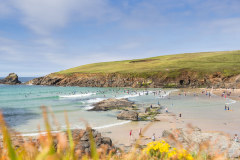 Trelas is the perfect home from home in all seasons, whether a full house of 8 or smaller group, enjoy the high life and stay in Cornish luxury. Trelas is set over 3 levels. Excellent stay - Trelas is a wonderful property! Would visit again. Great property in excellent location. We were extremely happy with the property. We thoroughly enjoyed our stay and the property is great.